If you are a runner, you know the thrill of getting out on the trail. Exercising is also extremely beneficial during pregnancy. 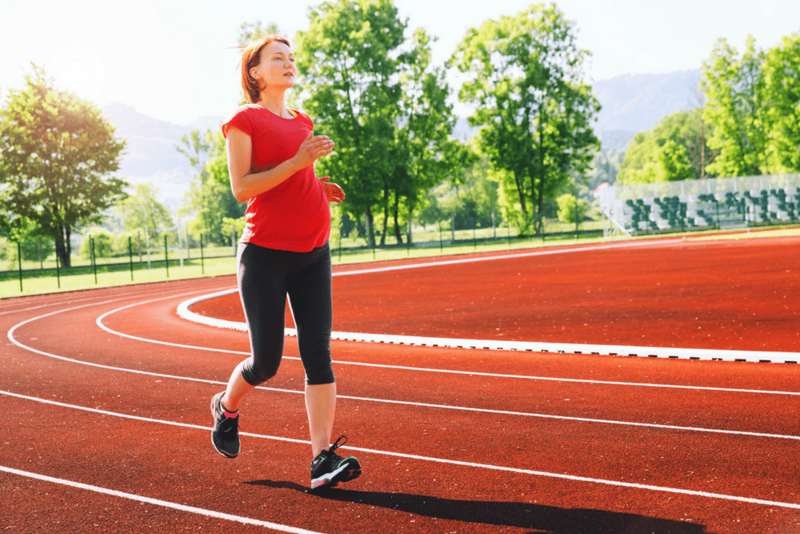 If you haven’t run before, you may want to consider consulting with your doctor before embarking on a running routine while pregnant. Running while pregnant for those that already run can be extremely healthy and support cardiovascular exercise. But, you must still remember that overheating is not good for you or baby. To avoid overheating, make sure you are properly hydrated and the weather conditions are such that it won’t make your body temperature skyrocket. While running sounds like a great idea, it can have serious repercussions too. If you are embarking on a running routine, consider some of these things before jumping in. This post may contain affiliate links. This means if you click a link on a product we recommend, we may receive a commission at no cost to you. You can read our full disclosure here. Did You Run Before Pregnancy? Which trimester are you in? 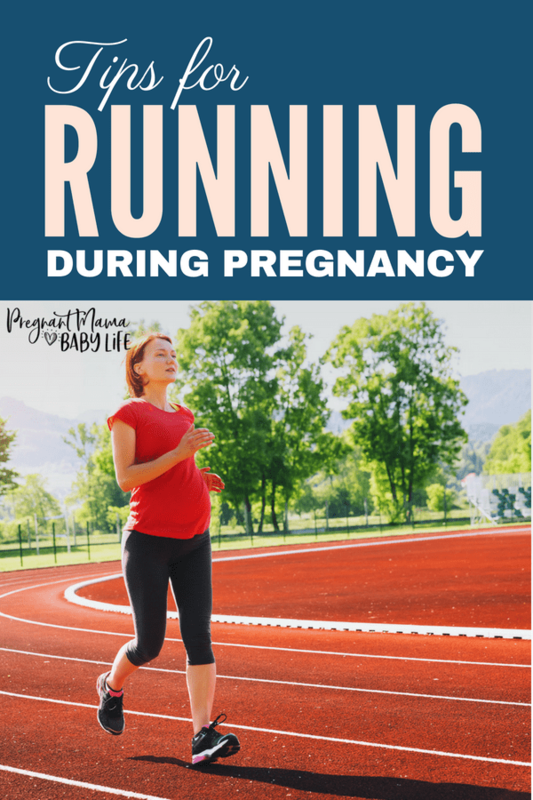 If not, starting a running routine while pregnant is probably not the best choice. If you have, then, consult with your doctor and make sure they are in agreement about your workouts. Taking care of your body while working out is essential. Make sure you have the right shoes with good support. Invest in a quality sports bra that will give your growing breasts the support they need. I also suggest a good pair of compression socks to help prevent varicose veins and feet swelling. Choose a running path that is level and even footed. This will prevent you getting off-balance and potentially reduce the risk of falling during later stages of pregnancy. A good idea is to choose a running track at a local high school or at a gym. This alleviates the concern for getting stranded. Running while it is rainy or wet can cause slips and falls. Make sure you choose days to run that are clear and sunny as much as possible. Or, use an indoor treadmill during adverse weather conditions. As with any workout, stretching and warming up is key. This helps prevent sore muscles and strains. Also, make sure you stretch post-run too to prevent your muscles from tightening. Probably not a good idea at this time. Save the training for a marathon or big run until after the baby is born. This is a time to be gentle on your body as it changing and your baby is growing. Training for a marathon can be too strenuous on your body and can lead to problems. Remember to adjust your running routine based on the trimester. First Trimester: You are probably okay continuing to run your normal routine as long as you stay hydrated and don’t get overheated. Second Trimester: Take some precautions. For example, find a smooth running surface as your center of gravity changes. Third trimester: Some runners find that a fast walk is better for them during this time. Whichever trimester, listen to your body. Running offers many great benefits like increased circulation, better stamina and increased heart and lung capacity. But remember, if you aren’t already running, it may be a good idea to choose another activity that is less stressful on your body like swimming or walking. Have fun and run but always consult your doctor or midwife before starting any physical activity.